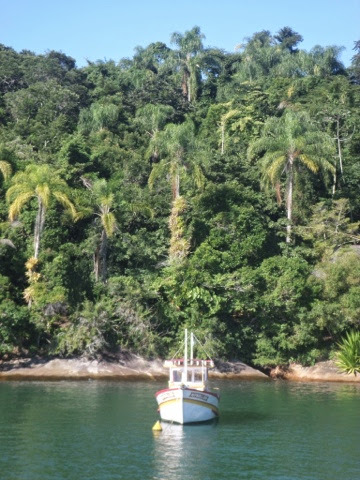 The journey to Paraty was a bit rough, very long and hot. 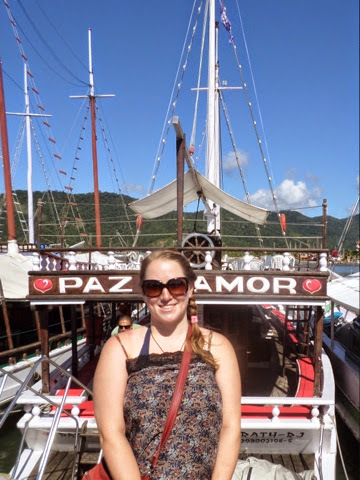 I had the most annoying woman sat behind me on the overnight leg to São Paolo, it was then a further six hour journey along winding roads to reach Paraty. We had to change buses part way through to a bus that absolutely stank, that wasn’t much fun! The proper name of the country is the Federative Republic of Brazil and it has a population of 198.3 million, so it’s huge in comparison to the other countries I have visited. The capital city is Brasilia, not Rio as many people think. São Palo is the largest city, with a population of almost 22 million, which is insane. Brazil is the fifth largest country in the world in terms of landmass and sixth in terms of population. They speak Portuguese here instead of Spanish, as it was a Portuguese colony. It’s a bit frustrating when you’ve gotten to be comfortable with a language to go back to that bewildering feeling of not being able to convey or ask what you want. Also, the number of English speakers is lower here, even in tourist areas. The country’s major exports are manufactured goods and iron ore. Brazil is also the world’s largest exporter of coffee and oranges. We have also now changed currency and are using Reales, not pesos. Brazil is one of the most influential countries in South America, with the largest economy and is one of the BRIC nations (Brazil, Russia, India and China). It is also home to the majority of the amazon rainforest, which is still at risk of serious deforestation due to settlers and agriculture. The forest is of international importance as it helps to control global climate. As of 2005, 20% of the surface area of the rainforest had been cleared – insane! The government has since stopped sponsored migration programs and deforestation reduced from an annual average of 27000 sq. km per annum to 50000 sq. km per annum between 2004 and 2010, a good start. Brazil is also internationally an important exporter of iron ore, most of which goes to China. Since the discovery of offshore oil Brazil has become self-sufficient and no longer has to rely on imports. Controversially the majority of agricultural land is owned by only a few very wealthy families. There is a movement to attempt to redistribute land and therefore wealth across the country. Although I’m not sure how successful that will be. In the larger cities there is still a fairly large disparity between the rich and poor, with a third of the population living in favelas, the slums. In São Paolo that equates to over 7 million people living in poverty in a single city alone! There have been growing protests and unrest in Brazil since 2013, in response to the large spending associated with the upcoming 2014 FIFA World Cup and the following Olympics. They are very unpopular events with the local population, which thinks that the money should be invested in improving poor quality services instead. Although the government has stated that the money paying for the games is coming from private industry, the public remains sceptical about this and believes that it’s coming from the public purse. Spiralling spending and international attention to the facilities are causing further unrest. Unsafe working conditions reached international attention this year after a large crane collapsed over one stadium damaging the stadium and killing two workers. 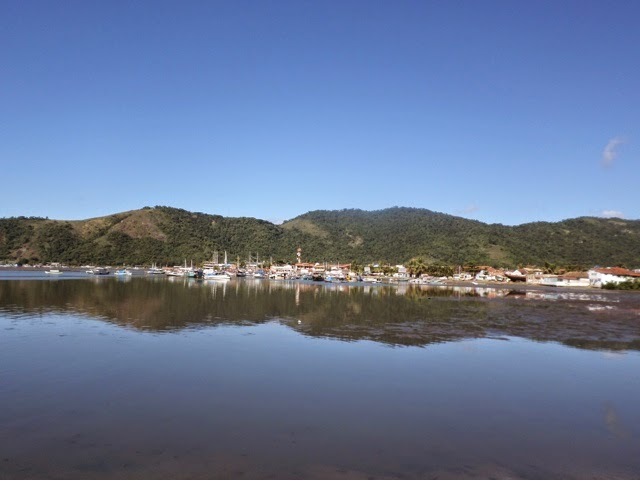 Paraty is a sheltered harbour that was established in 1650 and was a staging post for the gold trade route throughout the 18th century, when gold was transported from Minas Gerais to Portugal. 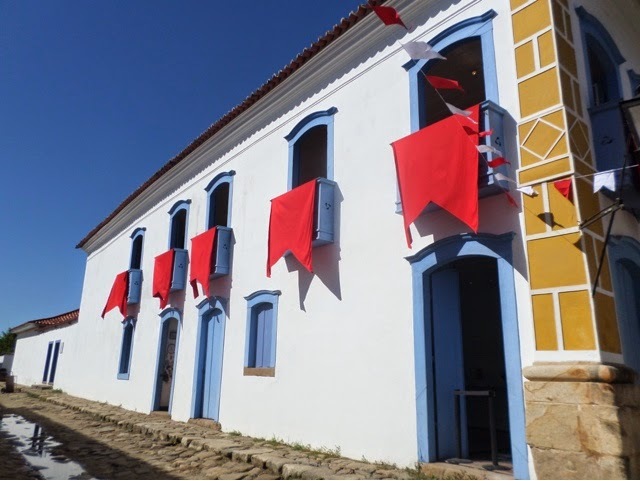 The city is now a UNESCO site and is considered one of the most important examples of Portuguese colonial architecture in the world. The entire city is actually now listed as a national monument. The land was originally settled by natives, the Guaianá Indians and the Portuguese gold routes followed pre-existing Indian trails. The site was frequently attacked by pirates, so a new route to Rio de Janeiro was established, sending the town into decline. It has become a quiet backwater, apart from a short renaissance exporting coffee in the 19th century. In fact until 1954 the city could only be reached by sea. It is now a popular tourist destination. 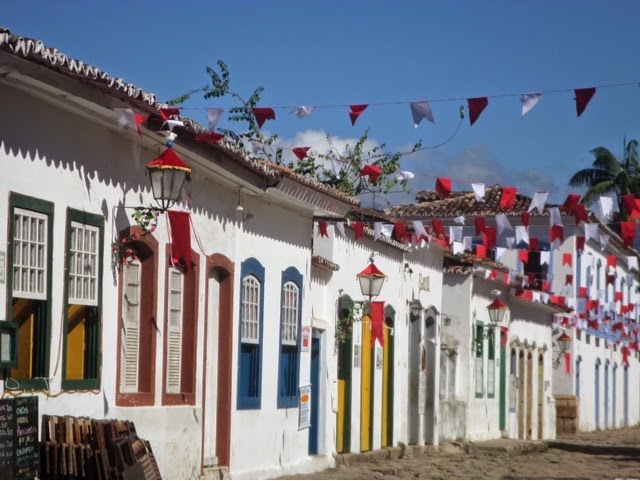 Paraty is an example of one of the first planned cities in Brazil. 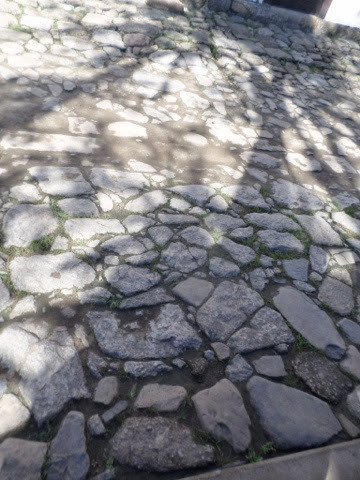 It actually has cobble stones in the streets that were engineered/arranged to drain away storm water and allow the sea to enter and wash the streets during high tides and the full moon. Walking around the street you can see examples of both Portuguese and Spanish style street drainage systems. The architecture is also far more markedly Portuguese than we have seen before. 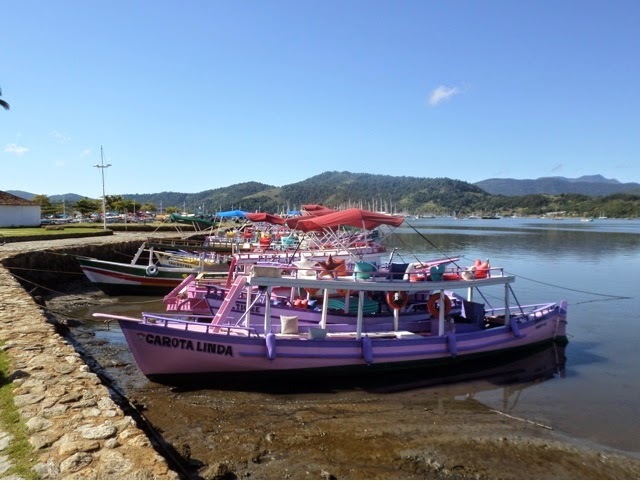 I arrived in Paraty in the evening and headed out to find something to eat. I had some great Calamari and Karen got an amazing stew with giant prawns cooked in brandy, yum. It’s so nice to back in the land of the sun and to be warm! Although the idea of shorts and swimwear is a bit terrifying after weeks of red wine and Dulche de Leche! The next morning I took a walk around the town, which took me through the cobbled lanes and down to the harbour. It’s a very quaint pretty town… Which mainly seems to just sell flip flops! 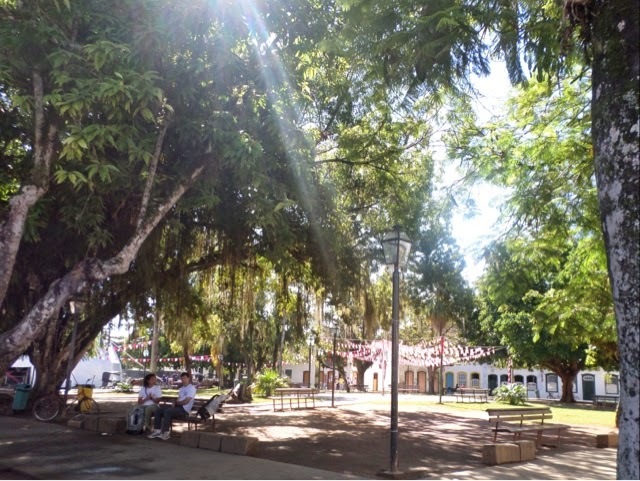 The main square, complete with May pole! The houses are all very quaint with brightly coloured door and window frames. The cobbled streets are supposedly quaint, but are actually just a bit annoying. The rocks used to surface the roads are actually imported from Portugal. As the port was the main route for gold export the ships would return ballasted with rock. I love the white washed walls and bright blues and yellows. There are loads of brightly painted boats, they all look so pretty lined up together. 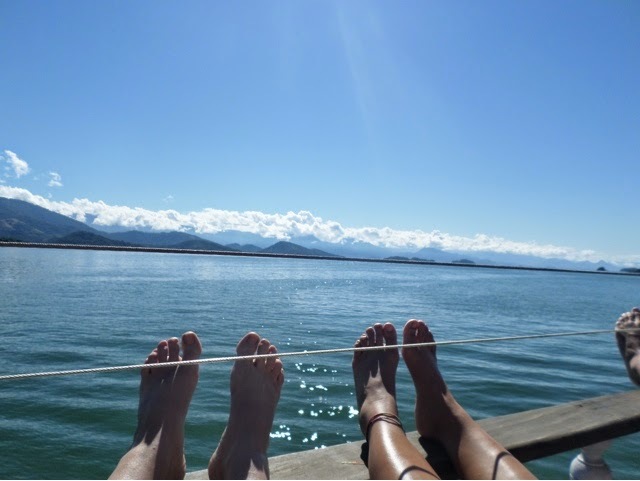 We then headed out to the pier where we caught our boat for the day, the ‘Peace and Love’. 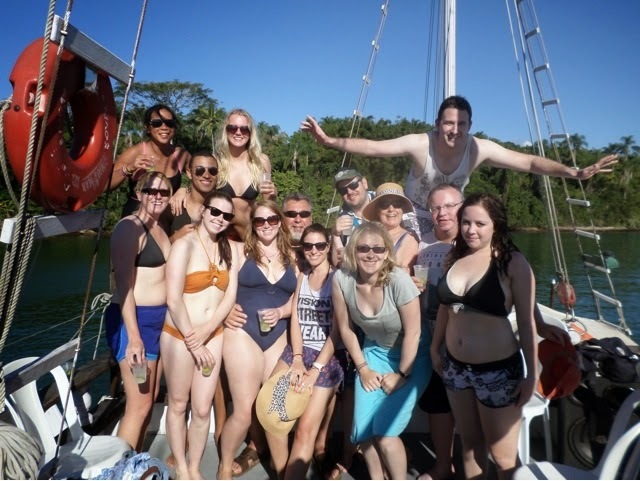 The day was spent sailing around the bay and the tiny islands dotted around. We were joined by another tour group from G adventures who were mainly from New Zealand and the UK. The trip included all you can drink Caipirinhas, the local cocktail… Which seemed like it might be trouble…. The weather was stunning and it was nice to just sit out in the sunshine. 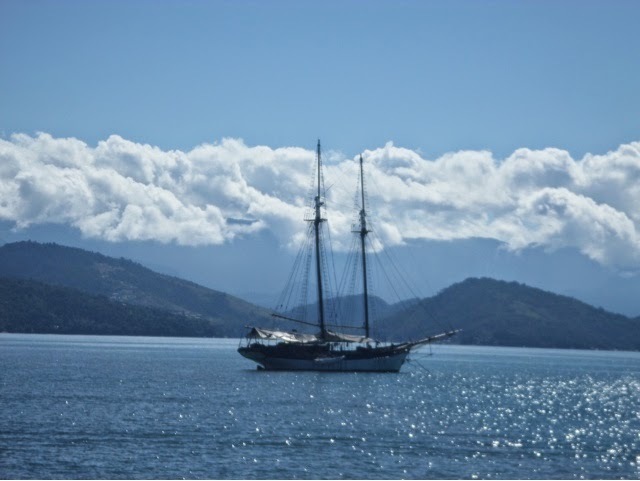 There were awesome tall ships also touring the bay. We stopped several times by small beaches or rocky outcrops. 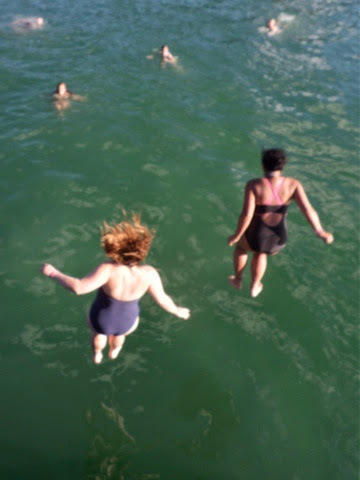 It was great fun jumping off the boat, which is about 5m high. The water was cool but not cold, so it was perfect for a warm sunny day. At one of the stops you could climb up the rocks and jump off the cliff too. The water was a great blue-green colour, but it wasn’t as clear as it is in Australian. To be honest I think living in Australia you get a bit spoilt for beaches. There were a few small boats around, but generally we seemed to have the world to ourselves. We stopped for lunch, grilled fish and prawns in mango sauce with salad, rice and potatoes, yummy. It was nice to have good fresh seafood. It’s definitely refreshing after having a few red meat having weeks in Argentina! And later on a bit more blurry eyed. As we headed back to shore there was a fair bit of dancing, which was hilarious. 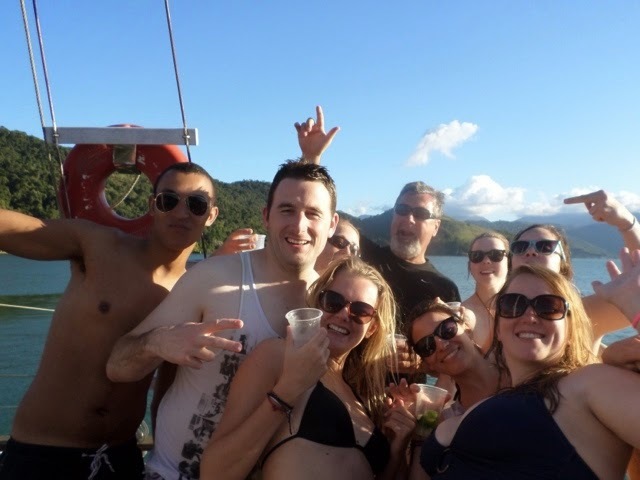 The g adventures guys definitely party way harder than our group does and I reckon most of them will have really sore heads today! All but one in our group seemed pretty ok and we headed home for dinner, although someone did have to be carried home. That night we had an early dinner and headed to bed. 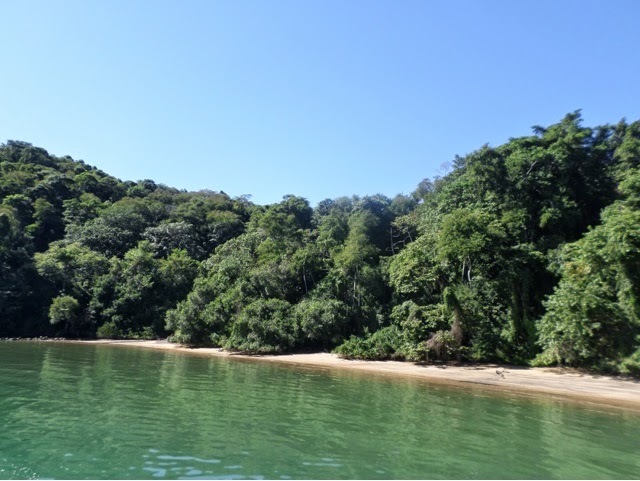 Today we catch a ferry over to Ilha Grande for more sunshine and island fun :-). I’m really looking forward to another few days of warm weather and hitting the beach. I’ve got to make the most of it before heading back to the frozen wastes of the Brisbane winter :-). I also can’t believe I’m now in the final week of my trip! I’m not ready for it to be over yet, I can’t quite face having to re-join the real world. 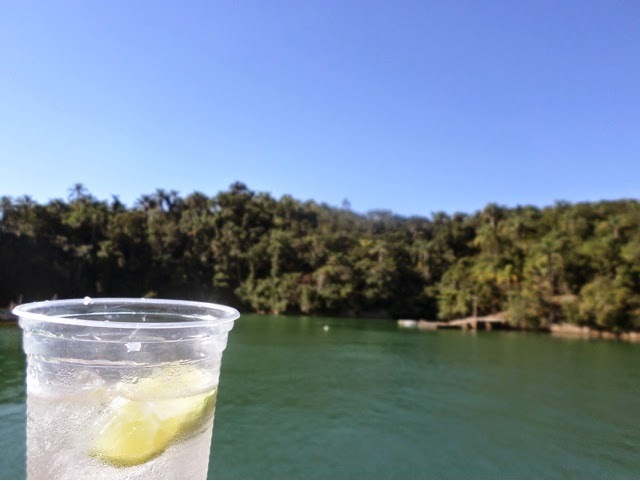 This entry was posted in Travel and tagged Boat Party, Brasil, Brazil, Caipirinha, Caipirinhas, Guaianá, Intrepid, Sao Paolo, South America, SouthAmericanAdventure, Travel, UNESCO. Bookmark the permalink.